This six-week-old coyote (Canis latrans) is making an early exploration outside the den—perhaps looking for its many brothers and sisters. 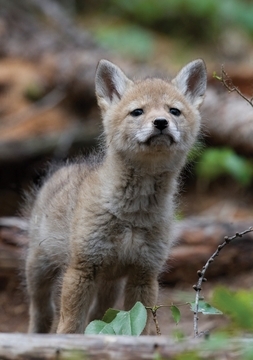 Coyotes generally mate in late winter, and in spring the female gives birth to as many as a dozen pups. The youngsters grow quickly and emerge from the den in about a month. In six to nine months the males set off on their own; females generally stay to perpetuate the pack. Smart and highly adaptable, coyotes can today be found in urban and rural areas across North and Central America—from Alaska to Panama.